Do you have a favourite item of clothing which you would love to recreate in a different fabric? This workshop will teach you the skills to copy a favourite item of clothing. You will make a paper pattern of your chosen item (you will not be making the actual garment!) and a cotton/calico toile ready for fitting. 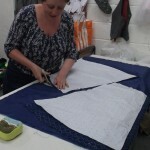 "Great course Emma, very enlightening & satisfying to have made a pattern & a toile, thank you" Andrea. Suitable for: Someone with some knowledge of sewing and is able to follow simple patterns. Please note: Please do not bring tailored items (ie; suits, tailored trousers). I would also recommend not bringing jersey items. If you are unsure of your chosen item I am happy for you to email me with a picture so I can advise you of suitability. Additional costs: None, pattern paper, calico, tools and refreshments are all included in the price.